All Harrelson Trumpets are GUARANTEED to meet or exceed your performing needs. Harrelson Trumpets is confident that your new custom trumpet will meet or exceed your expectations. 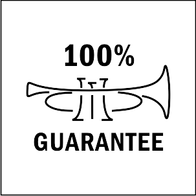 Every new Harrelson Trumpet includes a full 12-month guarantee. You may exchange your instrument* for full credit towards a new Harrelson Trumpet based on your original invoice amount allowing you to upgrade to a more efficient or different configuration without risking any of your investment. All Harrelson products include a 5-year workmanship guarantee**. *Requires trade to be in mint condition for full price exchange. **Any product found to have manufacturing defects is eligible for an equal value exchange at no charge.